An unforgetable journey - 13 days / 12 nights ! April: 9th, May 15th June 15th, July 15th, August 15th, September 15th. Maximum group size 18 people. Scorted Tour & Own Llama Path most comfortable tourists bus! This 13 day holiday takes you to Peru's most amazing attractions; lfy over the Nazca lines, enjoy the wildlife on the Ballestas Islands, take a boat trip on the highest navigable lake in the world (Lake Titicaca) and visit the majestic floating islands, travel to the Colca Cannyon to see the majestycs Condors soaring over the deepest canyon in the world and to top it hike the Inca Trail (or an alternative trek) to see Machu Picchu, the lost city of the Incas! Paracas and the Ballestas Islands - Close to the town of Paracas lie the Ballestas Islands, Peru's Galapagos. The Ballestas are home to large colonies of birds as well as sea-lions and attract nature enthusiasts visiting Peru. Nazca - the Nazca lines are a popular destination for tourists seeking the esoteri side of Peru. Many theorise that they were built by aliens or an advanced civilisation due to the fact that they are only visible from the air, whoever built them they are impressive. The Nazca Lines include images of animals such as hummingbirds, monkeys, fish etc as well as the 'Spaceman' and geometric patterns. Arequipa - with an impressive colonial center built from the white volcanic rock that is found in the area there are a variety of things to do whilst in the city such as visit the Santa Catalina Monastery or the museum where the Ice Mummy 'Juanita' is kept. The main attraction of the city is the nearby Colca Canyon where it is possible to see condors soaring on the thermals. Please Note: Times may change. Bolivia and the Salar de Uyuni. (Optional:Chivay hot spring not included). Private transportation and Tour Leader: Lima- Paracas-Nazca-Arequipa-Puno-Cusco. All Entrance fees to places visited on your tours *unless otherwise specified. Inca trail personal porter (*One full porter USD $180, Half porter USD $ 90 ) 1 full porters can be shared between 2 people. Extra snacks on trek and drinks. You will stay 3* Hotel category whilst in towns. On trek we will be using tents. In all accommodation you will be sharing with someone of the same gender to yourself (*unless you have booked as a couple). You may have single accommodation where available at a supplement. Please request at time of booking. 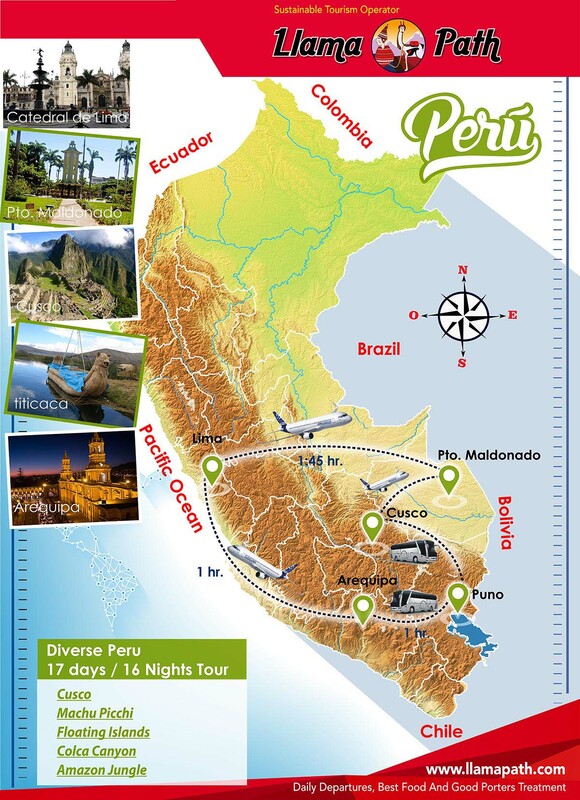 From USD 2099 per person (13 days / 12 nights) including Inca Trail or an Alternative trek to Machu Picchu! Tambopata Jungle Trip 3 days 2 nights From USD 430.00 per person (Double accomodation) + Flights (Aprox. USD 400.00 per person). Tambopata Jungle Trip 4 days 3 nights From USD 590.00 per person (Double accomodation) + Flights (Aprox. USD 400.00 per person). Bolivia, Uyuni Salt flats 2 Day /1 Night From USD 429 per person in the Group Service.